Youssef Absi, Patriarch of the Church of Antioch of the Greek-Melkites, concelebrated with the Pope. This morning, as usual, the Holy Father Francis celebrated Holy Mass at Saint Martha’s House. Today the Pope didn’t give a homily but pronounced brief words to explain the meaning of today’s celebration. Youssef Absi, Patriarch of the Church of Antioch of the Greek-Melkites, concelebrated with the Pope. At the end of the Holy Mass, the Patriarch thanked the Holy Father in French and, on the Pope’s invitation, they imparted the final blessing together. Here is a ZENIT translation of the brief words the Holy Father spoke in the course of the Mass, and of the Patriarch’s words of gratitude to the Pontiff. 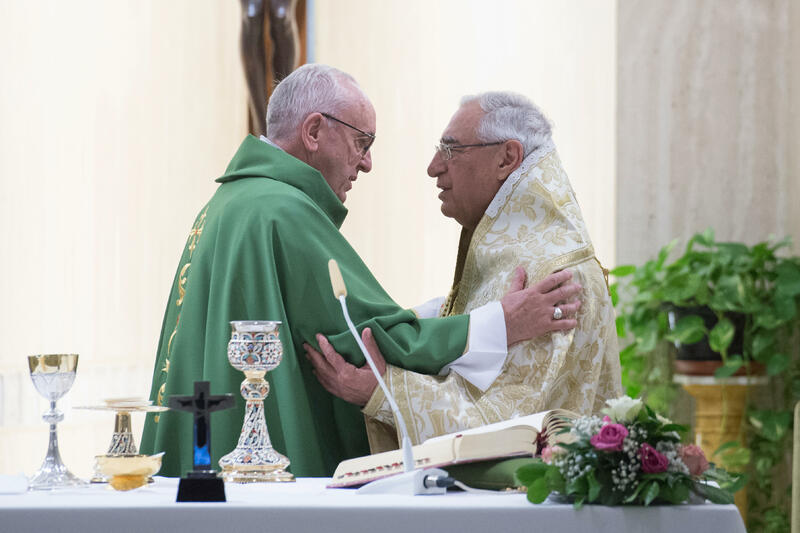 This Mass with our Brother, Patriarch Youssef, will effect the apostolica communio: he is Father of a Church, of a very ancient Church and he comes to embrace Peter, to say “I am in communion with Peter.” This is what today’s ceremony means: the embrace of the Father of a Church with Peter. A rich Church, with its own theology within Catholic theology, with its own wonderful liturgy and with a people – at this moment, a great part of this people is crucified, like Jesus. This Mass is offered for the people, for the suffering people, for persecuted Christians in the Middle East, who give their life, give their goods, their properties because they are driven out. And we also offer the Mass for the ministry of our Brother Youssef. Holiness, on behalf of all the Synod of our Catholic Greek-Melkite Church, I would like to thank you for this beautiful Mass of communion. Personally, I am truly moved by your fraternal charity, by the gestures of fraternity, of solidarity that you have shown our Church in the course of this Mass. We promise to keep you always in our hearts, in the heart of us all, clergy and faithful, and we will always remember this event, these historic instances, this moment whose beauty I’m unable to describe: this fraternity, this communion that binds all of Christ’s disciples.